So you’re a (insert job title). You provide people with goods or services and in return, they pay you for it. But being a pro isn’t easy, and despite the number of years you have spent in your line of work, mistakes can happen. Our independent insurance agents are real know-it-alls when it comes to professional liability insurance. And they’ll help find the right protection for you should some unexpected mistake rear its ugly head and bite you with a lawsuit. Depends. What’s your profession? Professional liability insurance varies depending on the pro who’s being insured. But basically, it covers you when you make a mistake. It helps protect you financially from legal claims and lawsuits all the way up to your selected policy limits. What Are the Most Common Professional Liability Insurance Policies? There are a couple of different coverage types based on what you do and provide to customers or clients. Malpractice insurance is coverage that’s specifically designed for medical pros (think psychiatrists, podiatrists and gynecologists). It protects against lawsuits that allege negligence or mistakes. Pretty much anyone working in the healthcare field should have a whole bag full of this type of coverage. Errors and omissions liability insurance (aka E&O Insurance) is coverage that’s designed for those who provide advice or services (think lawyers, consultants, insurance agents and architects). It protects against lawsuits and the like that claim a financial loss occurred based on bad information or negligent advice. A lawsuit can end up red-flagged in the inbox of nearly every kind of professional out there. And being prepared is always far better than not. So take the time to think of your future and the protection it needs. A claims-made policy must be in effect both when the lawsuit is filed and when the incident in the suit took place. This type of policy is the most common, and is usually cheaper. An occurrence policy covers any incident that takes place during the coverage period, even if the actual lawsuit is filed after the policy expiration. This type of policy provides more comprehensive coverage, but it also comes with a higher price tag. Think of the difference between the two like this: a claims-made policy is designed to protect backwards, whereas an occurrence policy is designed to look to the future and protect what may come. As always, an independent insurance agent can answer any questions you have about liability policies and can help steer you toward the right protection for your career and your livelihood. 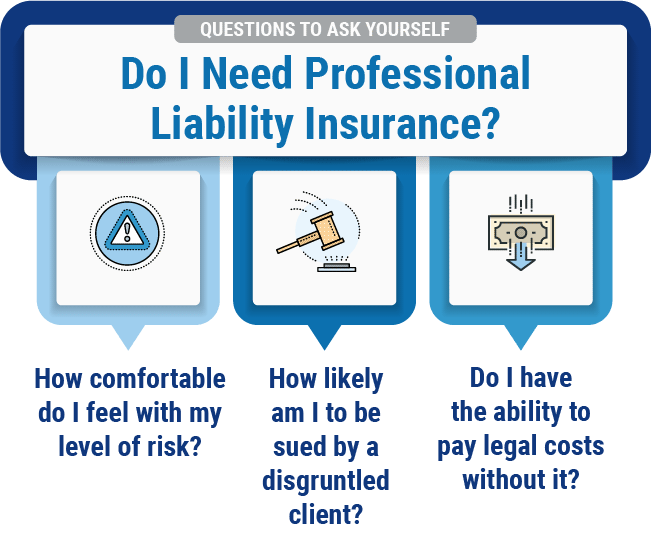 Why Should I Buy Professional Liability Insurance? Maybe you’re thinking, “Doesn’t my company have liability insurance to protect me from these types of situations?” You’re right. But you could be wrong, too. In most cases, if you work for a large company or clinic, it will have its own commercial general liability (CGL) coverage in place. But that only goes so far ,and there are many other issues that can show up unannounced that may not be covered. If you don’t have professional liability insurance, you may be in for a rude, and expensive, awakening. In any lawsuit, no matter whether it ends up in court or is settled just outside , it’s going to be expensive. Heck, just asking a lawyer to print something on their fancy letterhead is super-costly. Professional liability insurance is designed to help protect you from what could be a serious financial burden. That’s up to you. Well, it’s up to your profession. Whatever career path you’ve chosen will come with a certain amount of risk. The more risk involved, the higher the premiums. A policy for a neurosurgeon or anesthesiologist comes with a larger price tag than for a wedding photographer, as you can imagine. For a better idea of what you can expect to pay, talk to an independent insurance agent. They’ll dive right in and rustle up a smattering of solid policy options at different limit levels and premiums. Then you can figure out what works best for you, together. How fun is that? Our independent insurance agents will review your needs and help you evaluate which type of professional liability insurance makes the most sense for you. They'll also compare policies and quotes from multiple insurance carriers to make sure you have the right protection in place. For you and your livelihood. Insurance policies can be complex, and searching through options can be confusing, time-consuming and frustrating. An independent insurance agent's role is to simplify the process. They’ll make sure you get the right coverage that meets your unique needs. Not only that, they’ll break down all the jargon and explain the nitty-gritty, so you understand exactly what you're getting.